Automatically analyzes, finds, and removes audio problems such as background noise, room noise, hiss, hum, clicks, pops, crackles, distortion/clipping, and rumble while leaving the rest of your audio intact. Other features include a graphical learn noise mode, metering, MP3/FLAC compatibility, improved hum removal, additional media playback controls. Use as a standalone application or as a plug-in in your favourite DAW. 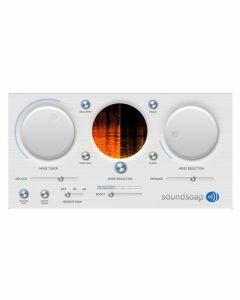 Plug-in requires compatible Audio Unit, VST, AAX, or AudioSuite host application. Internet connection for product activation. Mac OS X v.10.6 or higher for Audio Unit and VST plug-in, supporting both 32 and 64-bit formats. Standalone application requires Mac OS 10.9 (Mavericks) or greater. AAX Native 64-bit for ProTools 11/12. 64-bit AudioSuite for ProTools 12. Fully compatible with Mac OS 10.10 (Yosemite) and 10.11 (El Capitan). 1GHz or faster processor with SSE. Mac OS Files with more than one stereo or mono audio track are not currently supported. Supported file types for opening are determined by Apple's AV Foundation framework.